Having a parapet cap installed on your home is essential if you have a flat roof, which is very common in Grants, New Mexico, and surrounding areas. ABC Seamless of Albuquerque is the team that you can trust for any exterior project at your home. Having parapet caps installed will provide your home with the protection you require to prevent stains, cracks, mold, blistering, or other damage from occurring. 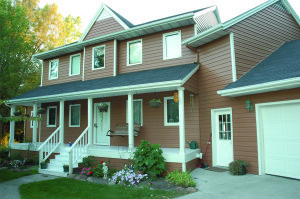 Parapet caps that are available in a large selection of colors to perfectly match your home. Custom bent metal that will go over the top of your parapet and up to six inches down the side to completely protect your home from water damage. Factory-trained and –certified installers who have been background checked and are just as trustworthy as they are knowledgeable. Furthermore, when you select us for your parapet cap installation, you will be able to breathe easy knowing that you are working with a team that has earned an A+ rating with the Better Business Bureau. Our installers will work tirelessly to ensure your complete satisfaction. For more information about the custom bent parapet cap products available for your home in Grants, NM, or a surrounding area, contact ABC Seamless of Albuquerque today. Make sure to ask about our convenient financing options available those who qualify.